Yesterday was my 2nd scheduled Zometa infusion and blood draw at the Onc office. I was really fine heading in. A nurse came out and talked to me in the waiting room about if and how much saline I wanted to do this time. When I was called back, I was in fine spirits and a talkative gentleman in the chair next to mine struck up an instant conversation. He has stage IV colon cancer, and is responding well to chemo. A medical assistant came to take my vitals. I was talking to my chair neighbor, and didn't notice until the stupid auto blood pressure machine squeezed my forearm twice, unsuccessfully, that I had let her put it on my left arm, and hadn't noticed because I was talking. Then I got irritated and told her WRONG ARM and get a bigger cuff or forget it. What good is a medical assistant certificate if you can't take blood pressure the real way? She said, oh yes, I have a bigger cuff...and successfully got a reading on my upper right arm. Luckily I don't have lymphedema problems. I was still OK, and chatting with my neighbor, when the REAL nurse came to do the needles. I showed her where my good/preferred vein was and looked away, as I can't watch needle stuff. I don't know what she hit or missed, but her first stab HURT! And not just the initial jab, but kept on hurting! This is the instant button for me to cry. I asked, through my tears, if this was for the IV, just to make sure we were on the same page, and because I thought surely the pain would stop soon. She said, no, she was taking the blood first. I thought she meant she was drawing the blood with a needle, and would then poke me again for the Zometa IV. Insert mini-melt-down here. I was crying quite pathetically. She kept telling me to calm down, that I was clamping down and she couldn't get the vein to work while I was clamping down. The pain continued, while I still looked away, and I assumed that all the fiddling she was doing was drawing the blood. I was sobbing. That's how I am with needles. I went on a tirade about the reason I was having my blood drawn here was to be poked only once, that I had only two veins to last the span of whatever life I have left. She tiraded back that no one can guarantee that I will only have to be poked once, which really confused me, and made me more angry. I tiraded that if I couldn't have the blood draw and Zometa infusion in the same needle, that I wasn't going to do either! I was sobbing and kind of yelling. 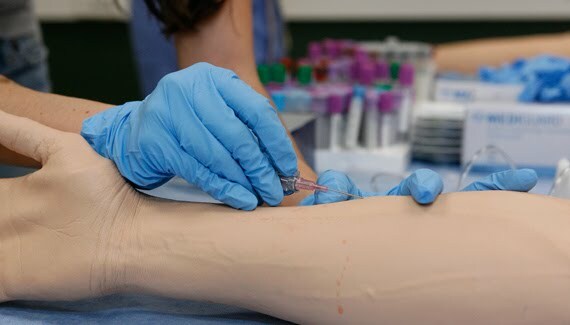 When she withdrew that needle, I looked/asked/realized that all the fiddling had been fishing and she hadn't gotten the needle in the vein or gotten any blood at all! She got a heating pad and wrapped my arm, and I cried and complained some more about getting the blood from the same IV as the Zometa. She said that's what she was doing, but couldn't get the vein. Well, that's not what I was led to believe, or what I understood. She was NOT patient, or compassionate, and did not explain it well enough. While I sat there with my arm wrapped in the heating pad, my neighbor asked if I needed anything. (still dabbing my eyes with tissue) I said, "no, unless you have some Valium on you", and then remembered that I DID have Valium on me! I popped a Valium and calmed down quickly, then moved to closed off/vegetative state. The nurse came back and got the needle in, drew the blood and started the saline. The rest of the infusion went off without incident, though I did not go back to chatting, and kept my head down over a crossword puzzle, cuddling the heating pad. After I checked out, I went back into the chemo room and apologized to that nurse for over-reacting. She said it was OK, that we'd get through this together. Well, maybe so, but I wont be getting through it together with HER anymore. I have no qualms with her skill (though now I know to specify that if the needle person doesn't get the vein at first, NO FISHING! Pull it out and try again), I did not appreciate at ALL her attitude. I don't know the name of the nurse who did my infusion last month, but I want her again, or the blond one who is nice. If you work in a chemo room, then you need to be able to handle crying tirades with the patience of a pediatrics specialist; I have Stage IV cancer and I'm not happy about it, and I hate needles. HATE! Traumatic! Stemming back to being six years old in the hospital. Lifetime traumatic relationship with hypodermics. I don't need to be berated for tensing up or clamping down, or TOLD that I need to calm down. I know the nurses rotate within the office, and the same people are not always in the chemo room, but I intend to ask that I NOT have this particular person again. I'm a big baby with needles, and if you're not good at it, or can't treat me like the baby that I am, then I don't have time for you. She asked me if I'd considered a port. I looked at her incredulously and said, "A port for Zometa??" A port is still a poke, though there's no hit or miss with it. And I don't want a port unless/until I have to do chemo. I'm not THAT wimpy. Agreeing to do Zometa was a BIG DEAL for me, and I worry about the side effects and possible side effects, and I worry that it's administered by IV. I want a nicer nurse next time. One who can still explain things to me if I panic or cry. I don't think that's too much to ask. I have a list of names at the local lab of phlebotomists who can find my veins without fishing or trying twice. I don't doubt the skills of the chemo nurses; they are the most skilled in the biz, but I expect nicer treatment and a little compassion. I iced my arm when I got home. There was a weird bubbled up place in between the two needle holes. 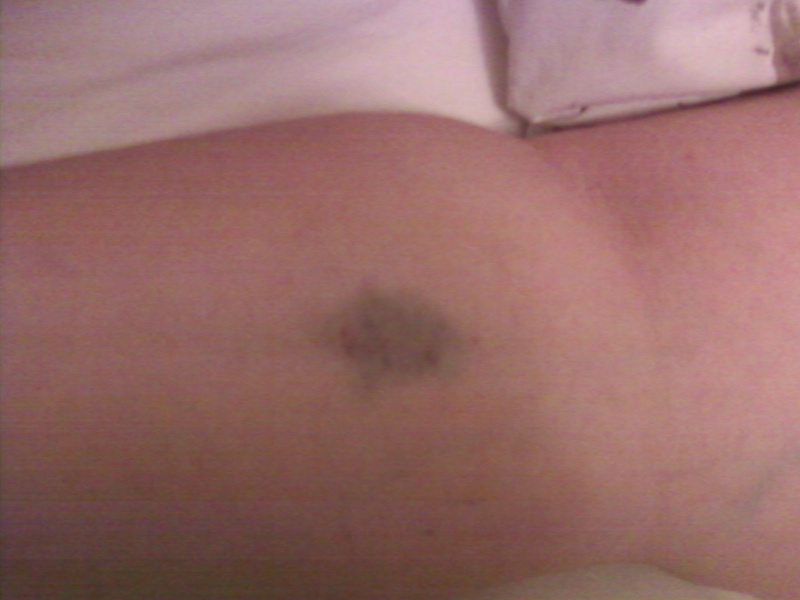 I iced it off and on all evening, and it's not swollen this morning, just bruised and a bit sore. On a better note, no fever and chills last night. I am achy today, joint pain, but I was happy to wake up and not have had any fever and chills. Holy CRAP! As a person who also is afraid of needles and pain I completely empathize. What is wrong with these people? Show some compassion, that's the business you are in and the profession you have CHOSEN!!! I have no patience for that or for school teachers who don't like children. Sheesh! Not that I'd like anyone to see me in one of those "states"...but thank you for "getting it"...and I totally agree! My sympathy...that would be me at the dentist's. I'm so extreme that if you told me your son was going to be a dentist, I wouldn't like him much anymore. But, like you, I go and put on my bravest face and hope that I can through it...without biting, I might add. I promise, I won't comment on every post . . . I think. My kids are supposed to get regular blood draws because of the psych meds they take. As a matter of fact, I'm pretty ticked off when they put my kids with anyone that 'fishes'. I don't care how hard it is to find a vein, these are pediatric patients AND there are developmental disab. involved. So the fact that my kids aren't the ones reigning down expletives at the nurse/phlebot. makes me all the more impressed with my kids. I've (in my mind) gotten to the point of suggesting they find another line of work (rather than drawing blood) if they regularly have to leave a bruise or go back and forth with butterfly or standard needles, elastic bands or blood pressure cuffs. Thank you, Marnee - comment on anything you like...I love comments and love that my ramblings resonate with someone. My watchword these days is VALIDATION, and we all need it for what we're feeling. It makes all the difference.